Learn styling techniques used by Aisa Ipac, stylist of Filipino singer, actress, and host: Karylle; as well as styling tips from Tin Iglesias and Tracy Ayson. Know the secrets of Lissa Kahayon and Tin Iglesias on how they made it big in the blogging industry by attending their Fashion Blogging 101 Workshop. To reserve your slot, sign up here. Join their giveaways below! Shop with Me at EMBELLISH! 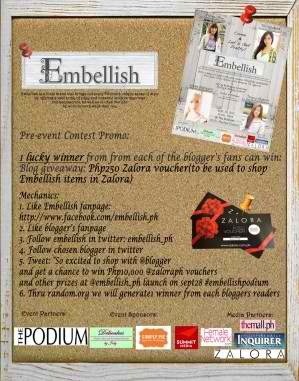 8 winners will get a chance to win P250 ZALORA Voucher + P1k Embellish GCS + shop with their chosen blogger at Embellish Podium! 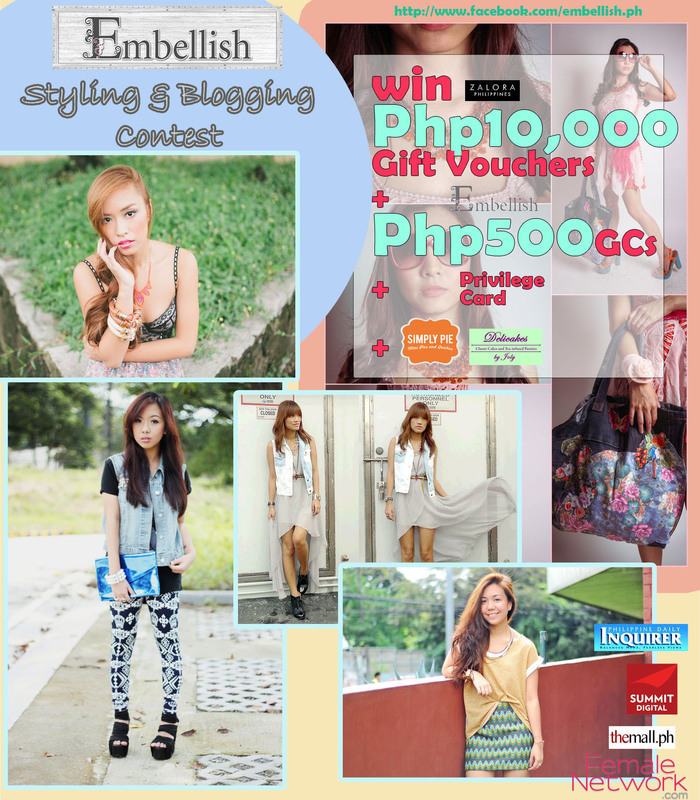 1) Comment on my picture at EMBELLISH's page, state a reason on how she brings out every Filipina's unique sense of style. Go here. 2) Blogger will choose 2 readers with the best answer. Winners will be announced on September 27, 2012. 3) Winners will get to shop one on one with their chosen blogger on September 28, 2012 (after the workshops). Php250 Zalora Voucher is just a Tweet Away! Follow this blog via GFC or Bloglovin' and follow me on FACEBOOK or TWITTER. b.) and matching it with anything from our shop (Podium or Shoppesville). 2.) Contestants will be asked to blog about their look and inspiration, as well as how well it projects EMBELLISH. 3.) Each Lookbook picture entry must contain the Embellish logo. 5.) 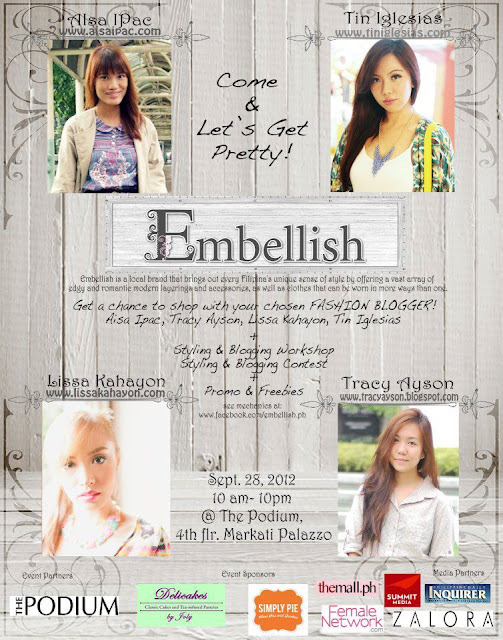 Contest is open to others who weren't able to attend the EMBELLISH mini launch event. 6.) Contestants can submit more than one entry. 9.) All bloggers will be giving their constructive comments to each entry in their blog. 10.) Winners will be announced on November 9 (Friday).